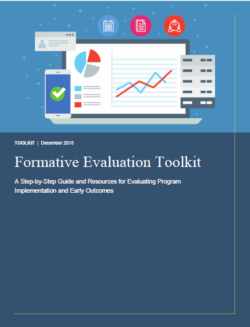 A new toolkit walks users through the process of formative evaluation, a method for evaluating programs during early implementation to inform improvement and assess readiness for rigorous summative evaluation. Understanding Formative Evaluation provides an overview of formative evaluation, explains how it differs from summative evaluation, and describes the role of formative evaluation in the evidence-building process. Meeting Preconditions of Formative Evaluation poses questions and provides resources to help programs lay the groundwork for formative evaluation. Conducting Formative Evaluation outlines the steps to design and conduct formative evaluation and use the findings to improve programs and determine readiness for summative evaluation. The toolkit was developed on behalf of the Children’s Bureau, Administration for Children and Families, primarily for child welfare agencies and professionals to use in partnership with program evaluators, but others in human services may also find it useful.